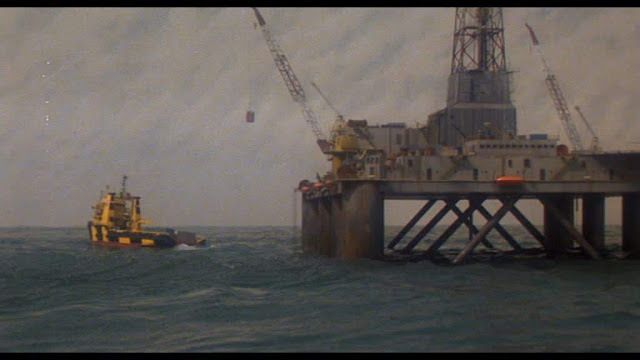 This quirky tale features Roger Moore as a strange cat loving woman hating leader of a team of specialist underwater saboteurs. 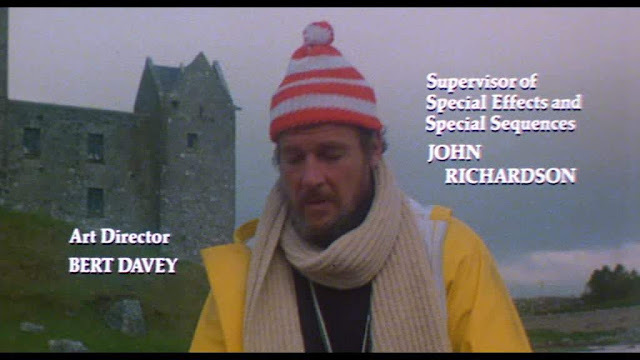 More importantly, as far as this site is concerned, it also has some very fine miniature tank work supervised by John Richardson. 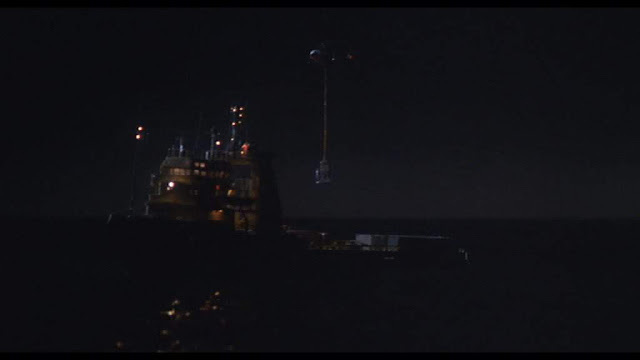 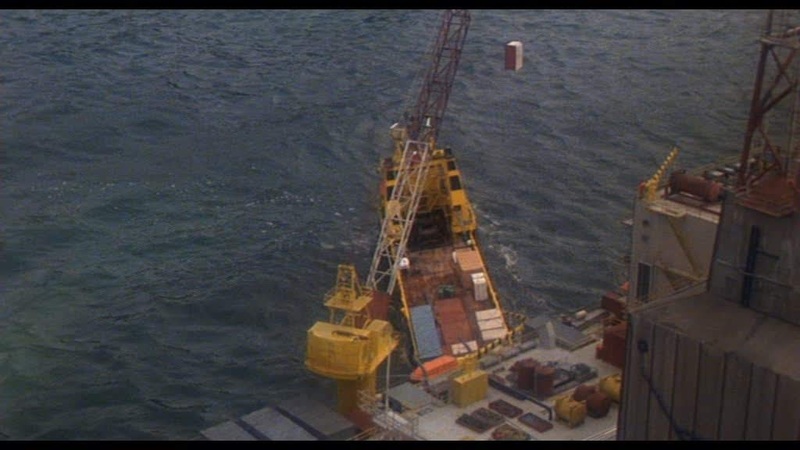 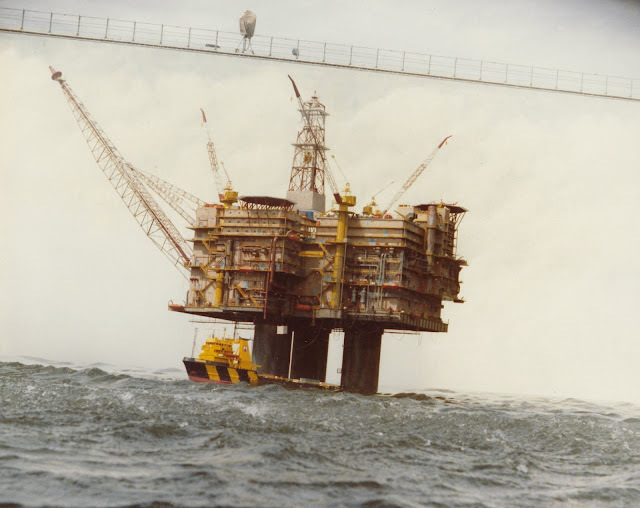 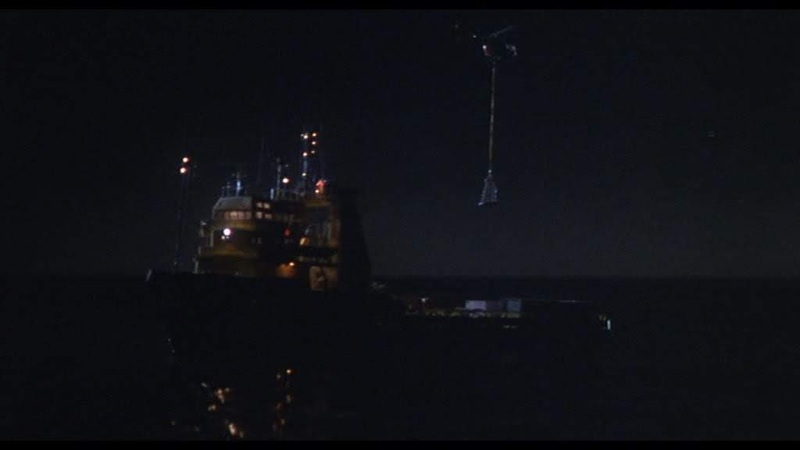 There is a couple of miniature oil platforms, a rig service vessel and a miniature helicopter involved in the action of the story. 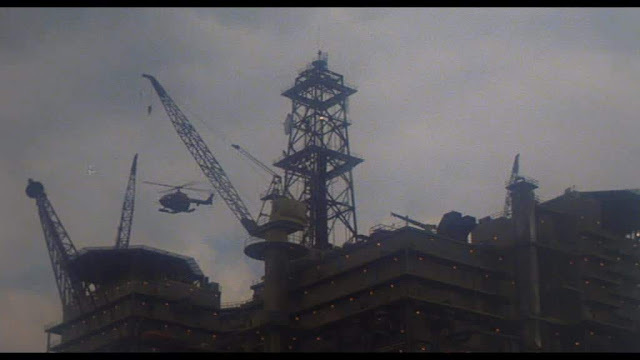 Nigel Brackley of NB Modeltronics built and operated the model Bolkow BO 105 helicopter for the bomb dropping sequence. 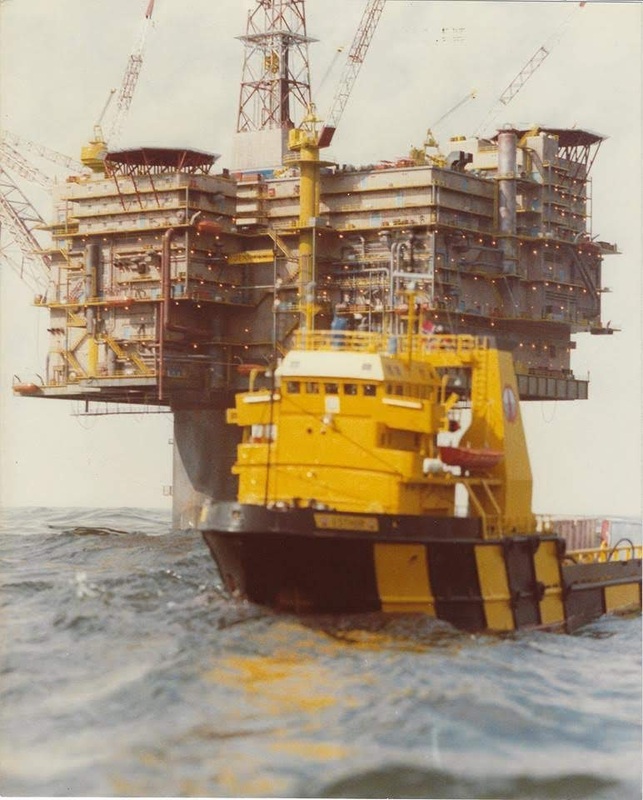 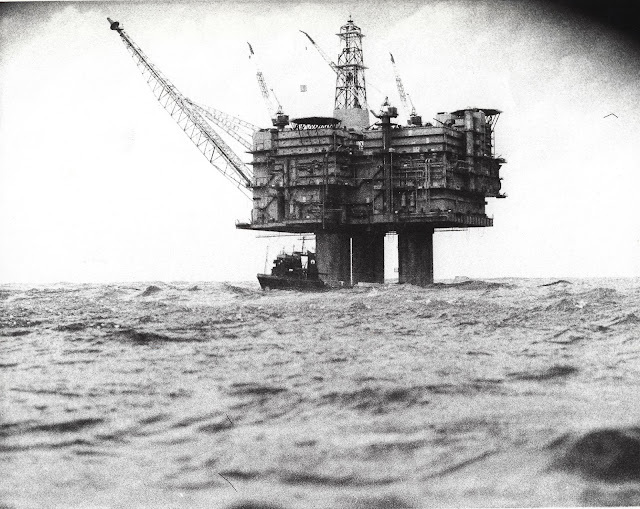 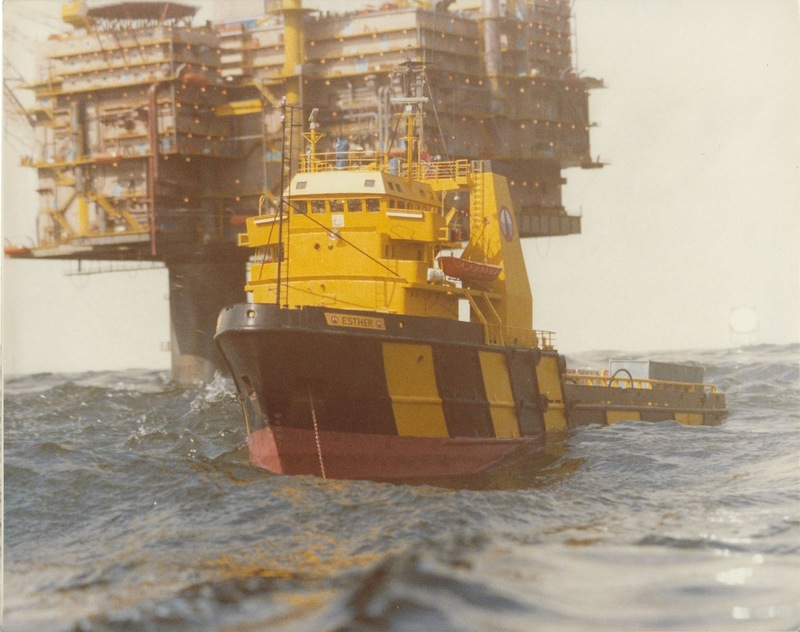 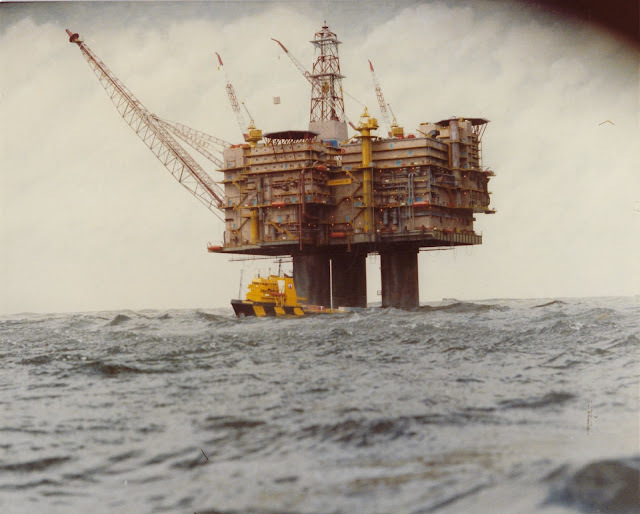 Particularly noteworthy is the tiny mechanical figure which can be seen walking on a gangway of the rig to impart some life to the miniature. This is a film that I originally caught late night on TV in the 80's and was astounded at the quality of the miniature work, having never heard of the film. 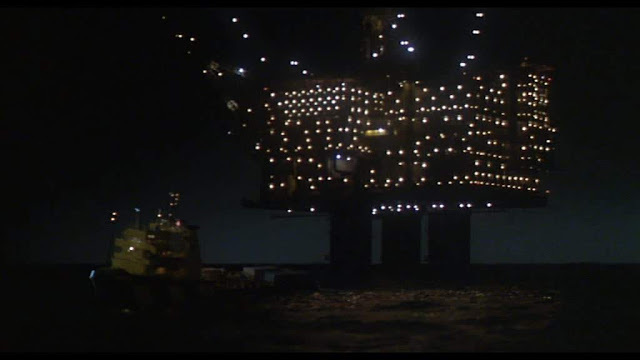 I would love to know more about the miniatures but have never once come across any information of any kind about the film's model shoot. The platform miniature sitting in the empty tank with sky backing screen behind. This must be a test of the practical lighting as the model is not yet painted. 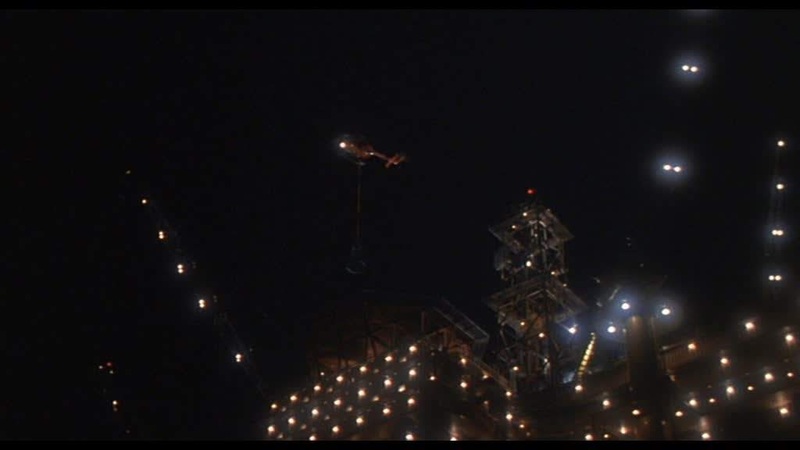 Small orange figure ( Top middle ) walks along the side of the model. 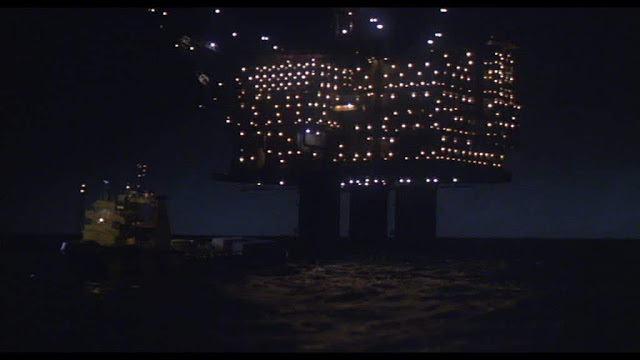 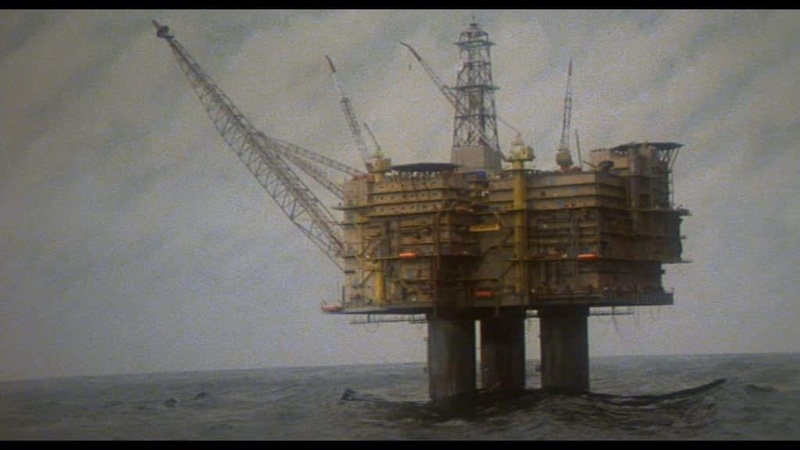 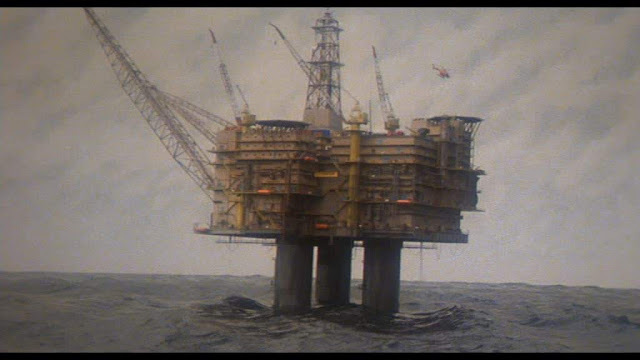 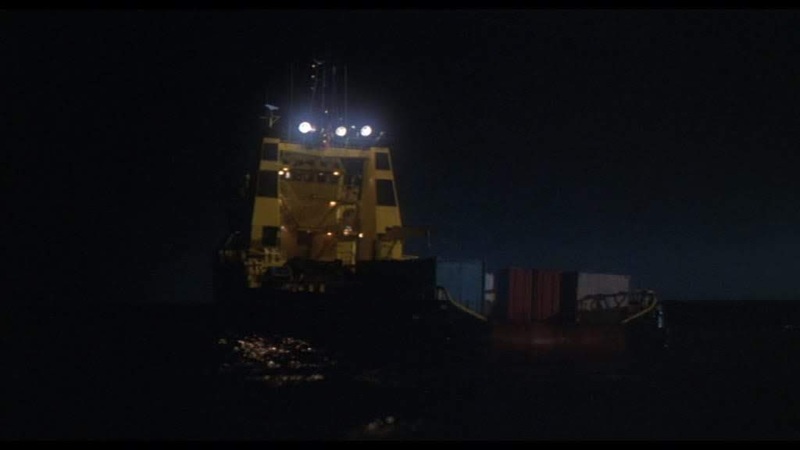 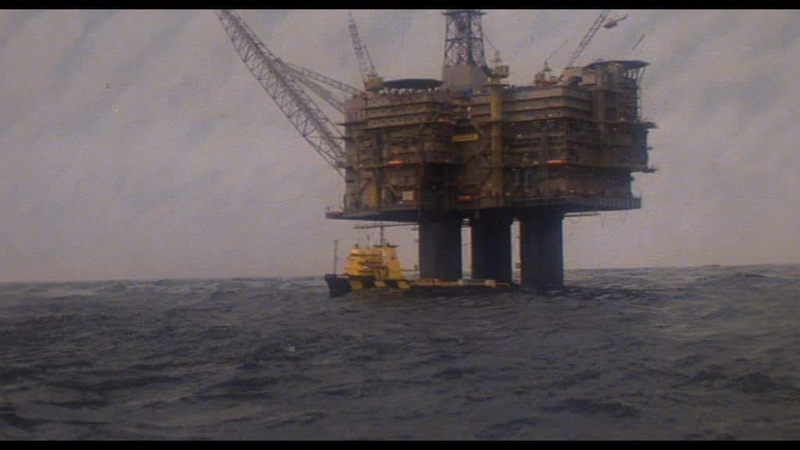 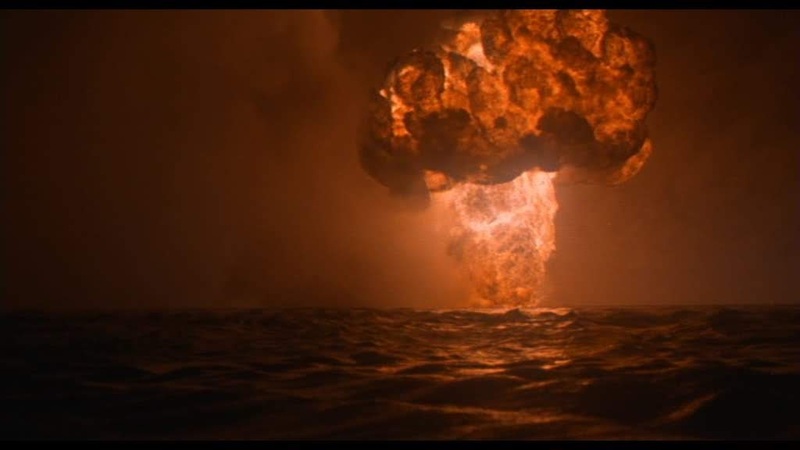 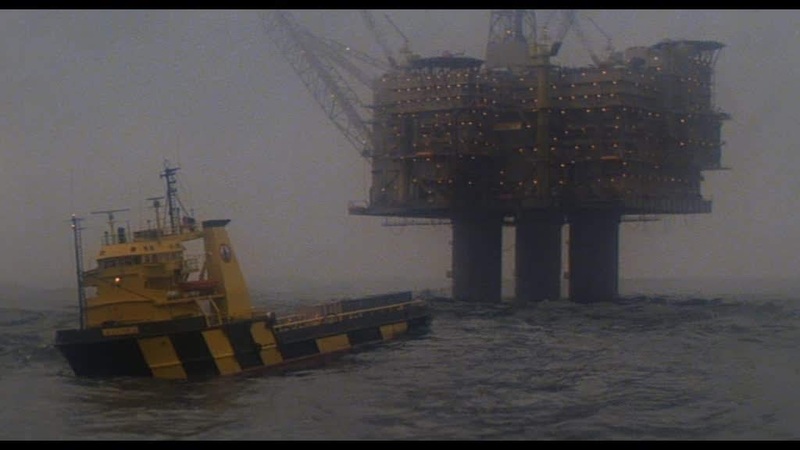 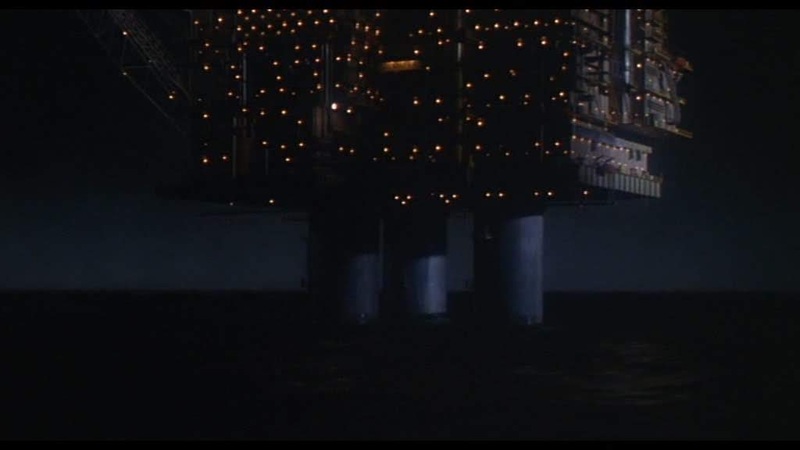 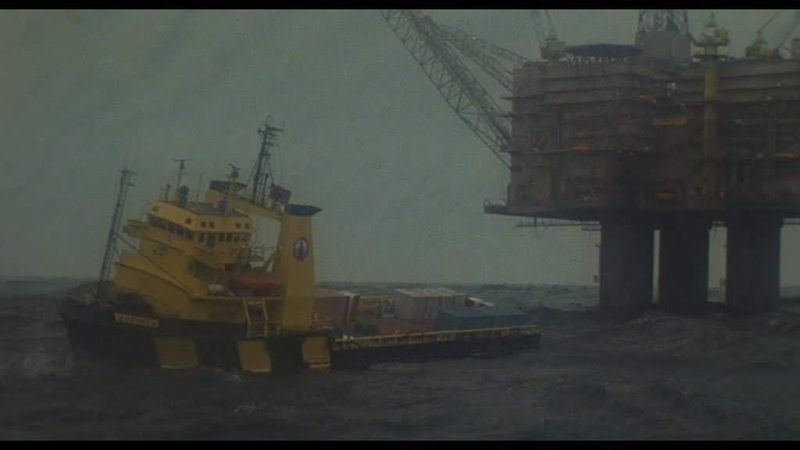 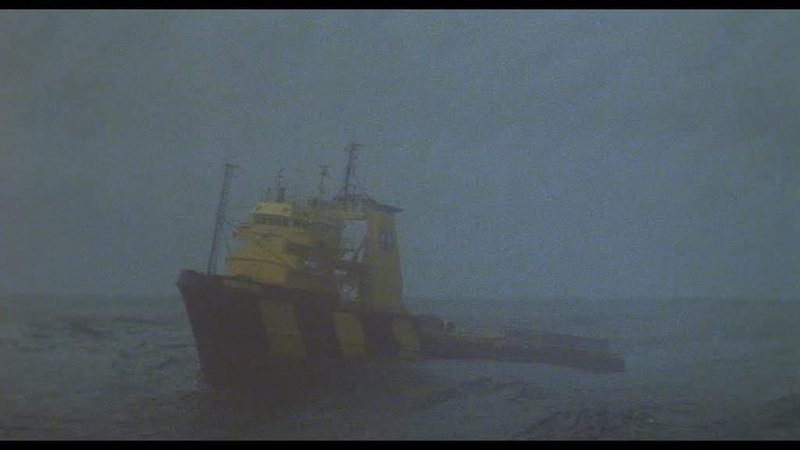 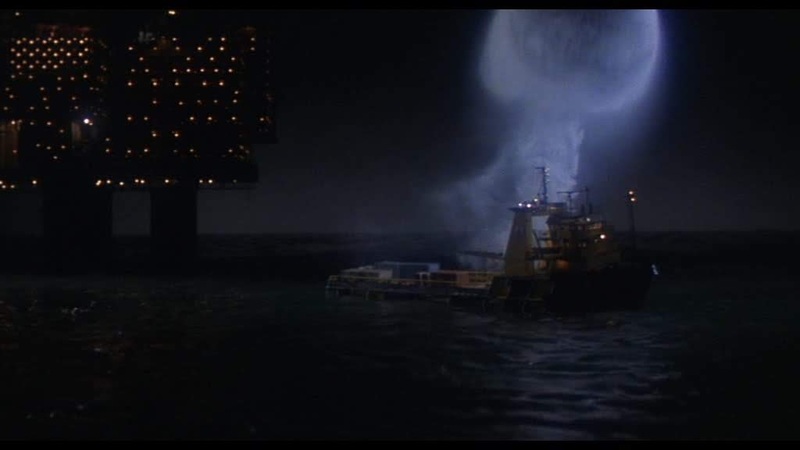 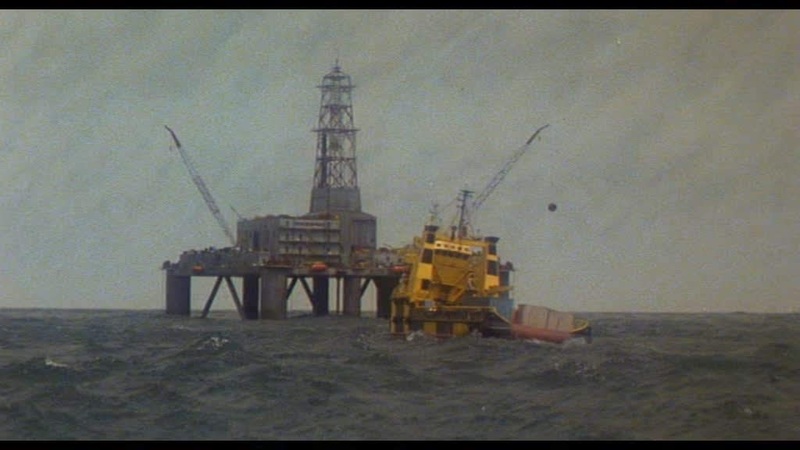 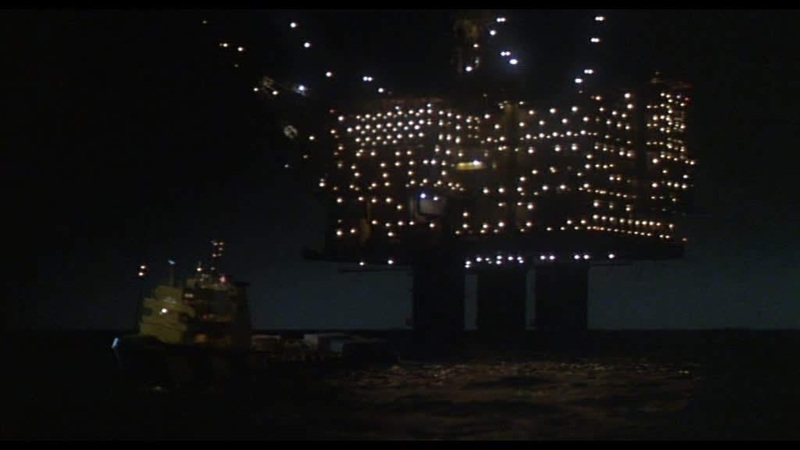 It has some very mechanical motion but is just glimpsed in the film and is quite effective at making you think you are looking at a real oil platform. 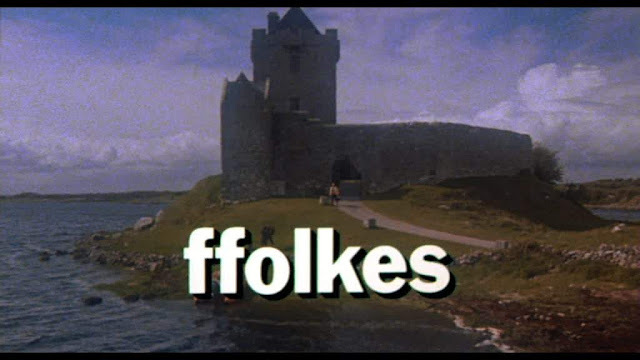 I saw ffolkes at the movie theater and recently got to see it On Demand TV. 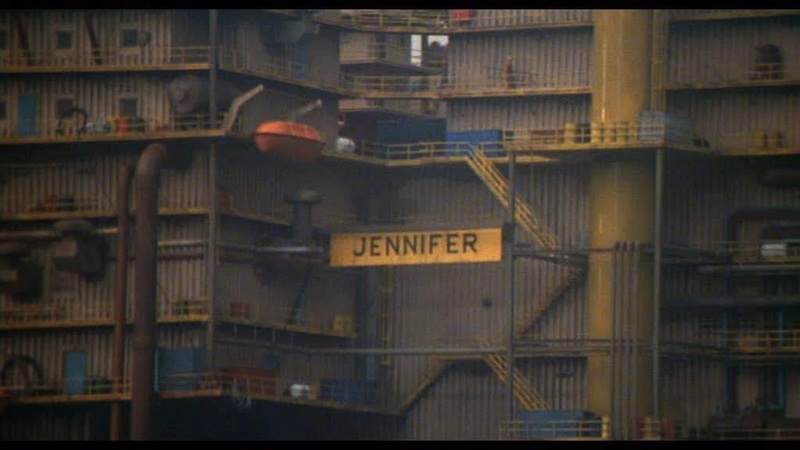 The Guy walking across a deck on Jennifer sold me that they had filmed some at real platforms. The supply ship "Esther" was actually a Norwegian Viking Line's ship, the "Tor Viking". Filming aboard the ship took six weeks. 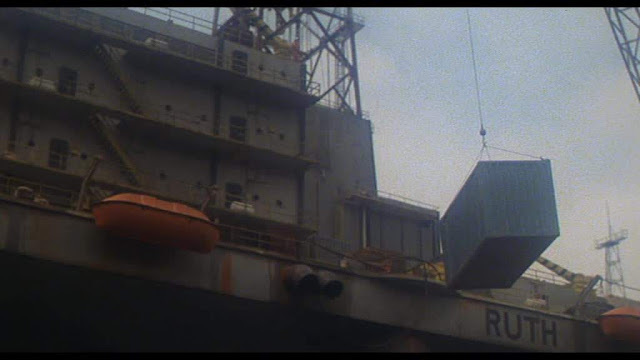 There may some model work. 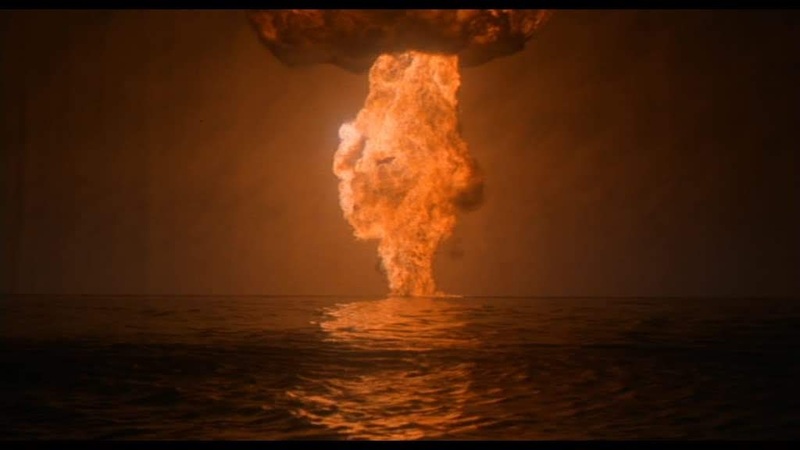 Given your comments, I took closer looks and some are potentially very well done models. 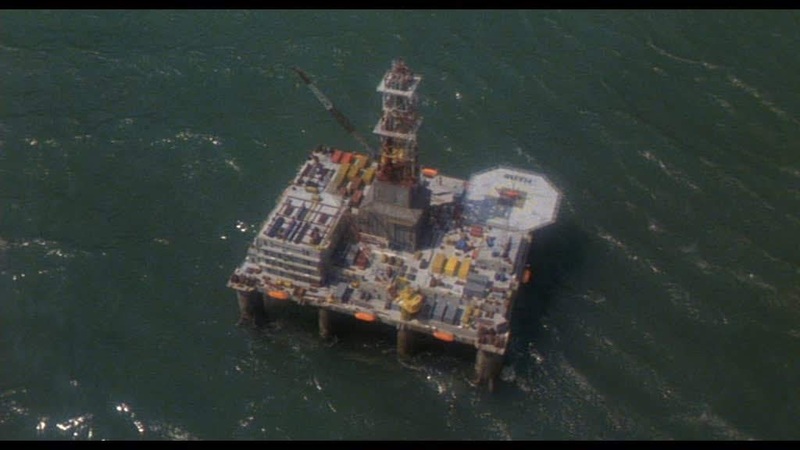 But several external shots could easily have been Second Unit shots of any of almost 500 rigs. 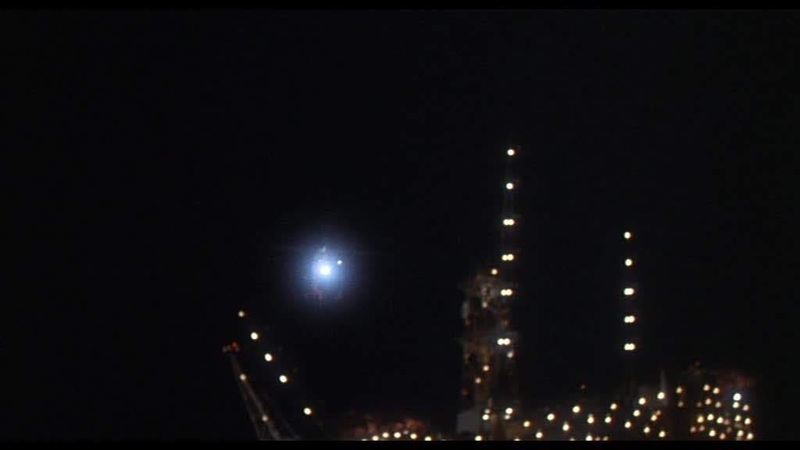 And there are plenty of closeup helo shots. 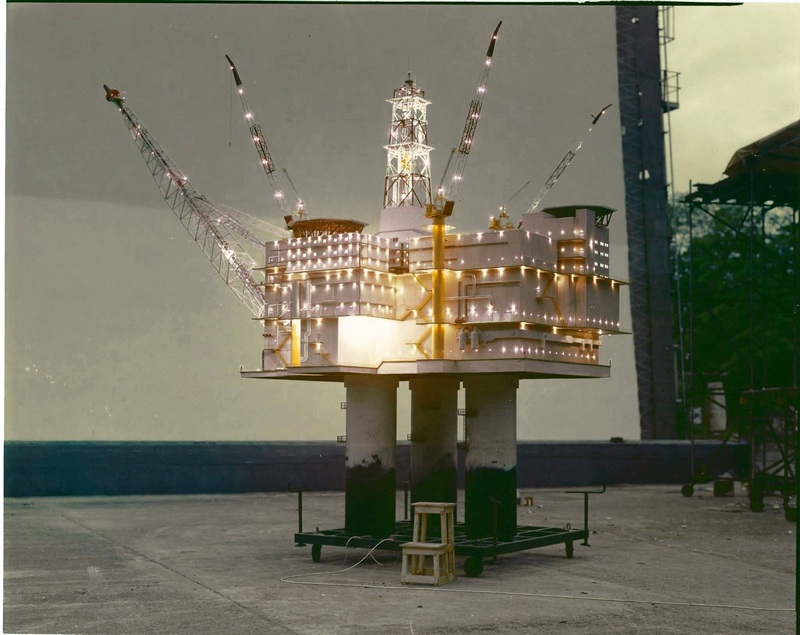 It wouldn't make sense to spend a huge amount on models when the craft and facilities were readily available. 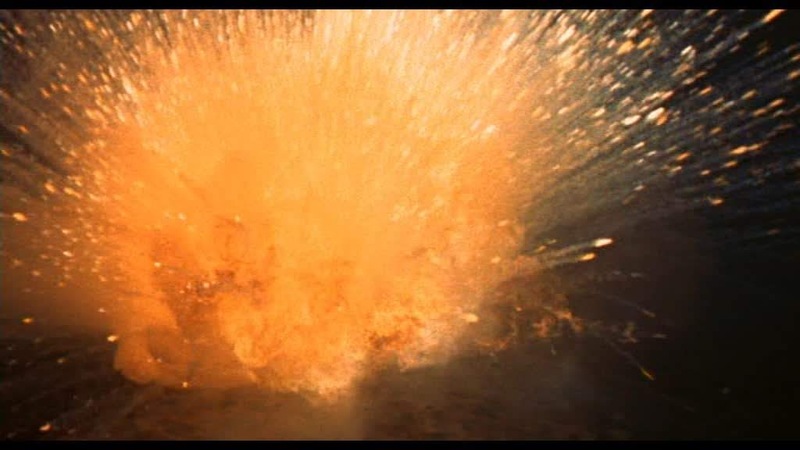 I would assume the explosions were done with models. The rest may be real. 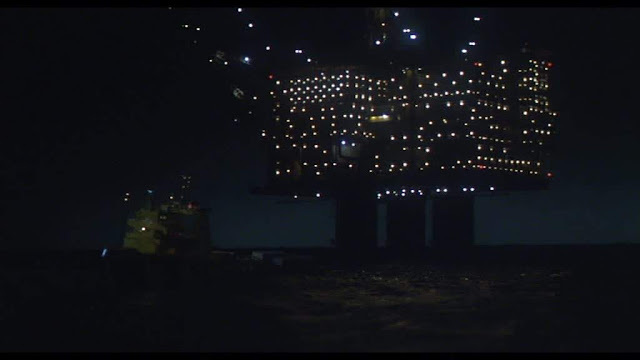 I'm pretty certain that every shot shown above is of a miniature and not the real thing. 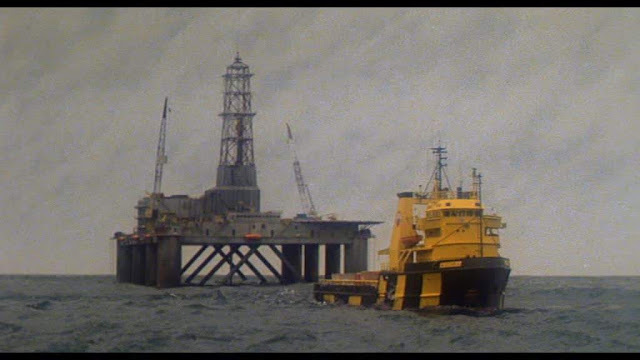 I would think that oil companies in general would be be unwilling to co-operate with a film that depicts the hijacking of their oil rigs. 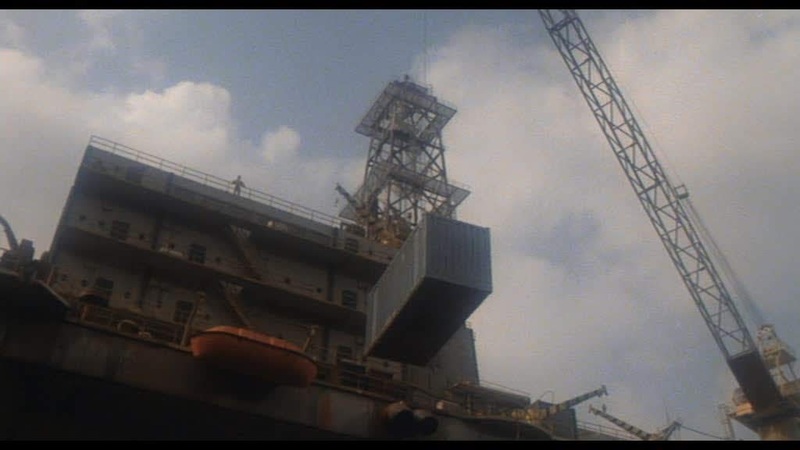 The special effects supervisor would be chuffed however that the miniature shots are taken as the real thing and they are particularly well crafted in this film.